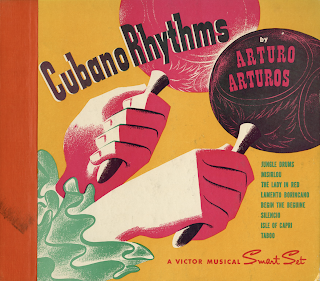 From Billboard - February 14, 1942: Backed by the rhythms of the characteristic drum instruments of the Latin Americas, this album showcases the piano playing of Arturo Arturos. 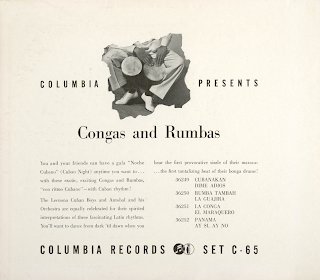 Eight sides are variated to provide the rumba, Afro-Cubano, beguine and bolero rhythms, titles including Jungle Drums, Misirlou, The Lady in Red, Lumento Borincano, Begin the Beguine, Silencio, Isle of Capri and Taboo. While the setting is authentic enough and Arturos follows the melodie line nicely, there are none of those intoxicating improvisations from the melody instrument, with attending changes in the melody and mood to match the changing maze of drum beats, akin to the jam sessions of our own musicians. From the back cover: There are no set of patterns of rules for getting a start in the entertainment business. The stories are numerous – running from the old fashion "horn in a truck" routine to the dramatic last-minute replacement of an understudy for an ailing star. It's usually some little trick of fate that sets the wheels in motion and changes the course of a person's life. 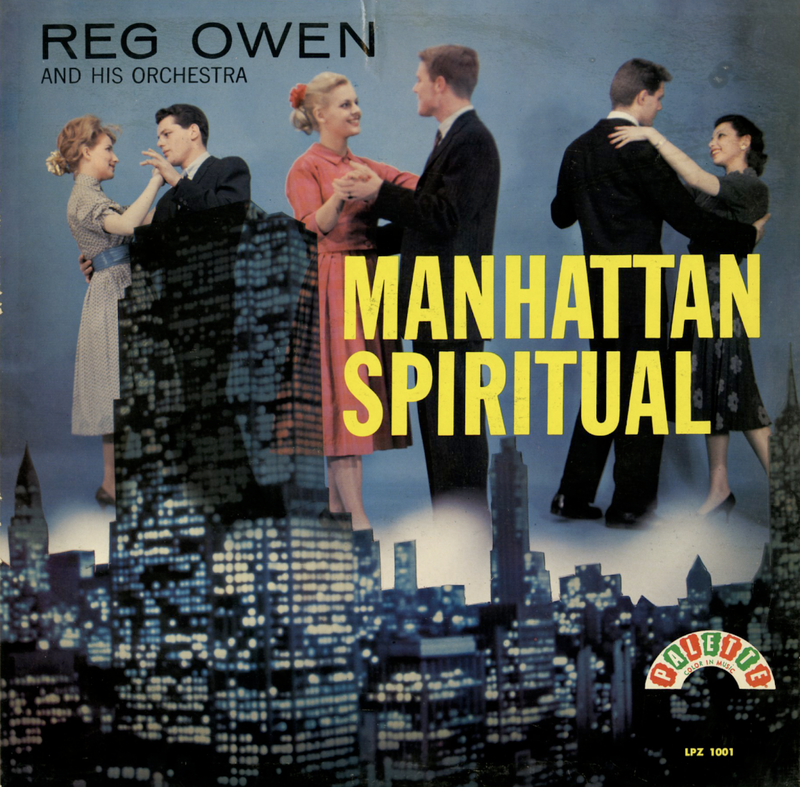 In Reg Owen's case it was a gift of a saxophone, when he was a boy of 15, that shaped his future. He was recovering from a serious attack of peritonitis when his father brought him the sax as a get-well-quick token. He started playing it during his convalescence and hasn't stopped in the more than two decades that have followed. Instead of going into the textile business in London, as his parents desired, he decided to use his self-taught knowledge of the sax as a stepping stone to a musical career. The career began inauspiciously with a group called the Royal Kiltie Juniors Band. The salary was only one pound a week, with free board thrown in, and it only lasted six months but it was enough to whet his appetite to get into the music business more seriously. He studied saxophone with Benny Goodman's famous band, and then went on to the Royal College of Music in London. In 1938 he was ready to start on his own and formed a group called "The Local Gig Band." He made the rounds of the London clubs for the next year and then organized the eight-piece outfit which set up shop at the Montague Ballroom at Ealing. He was playing with Harry Roy's band at the Embassy Club a year later when he was called into the RAF. During his five years in the service, as a member of the RAF Band, he taught himself arranging by transcribing all the works of Artie Shaw, Tommy Dorsey and Benny Goodman. Reg learned his lesson well because on the day of his discharge from the service in 1945, he received a call from Ted Heath and became one of the founder members of the Heath organization. He stayed with the Heath outfit for 10 years as a sax sideman and then gradually taking over all the writing and arranging for the band's library. 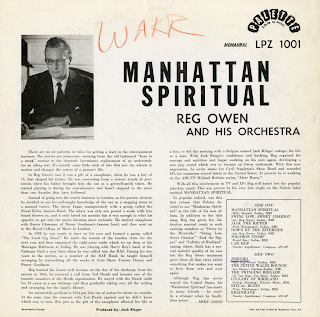 From Billboard - March 30, 1959: Reg Owen and his Ork. 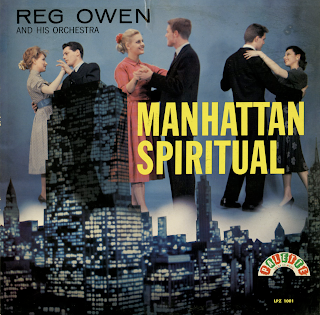 the English crew that recently had the big hit "Manhattan Spiritual," have a swinging driving album here that could also turn into a runaway best-seller. The set contains the hit tune, plus the band's new release "Down By The Riverside" and 10 other tunes played with an exciting rocking beat. 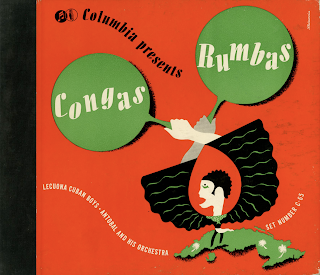 "Jericho," "The Petite Waltz Bounce" and "Swing Low Sweet Chariot" could easily become single hits themselves. The stereo sound is outstanding. This set swings.